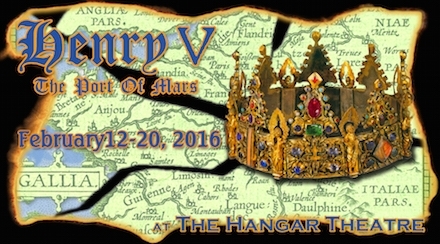 Tickets for Henry V are being sold through the Hangar box office, and this year you can choose specific seats! Henry V is unique among Shakespeare's works for the way it uses a Chorus figure to present the story to the audience. This Chorus is like a professional storyteller: she addresses the audience directly to set the scene, introduce us to certain characters, and fill us in on events that happen between scenes. Her presence makes Henry V feel almost like story theatre at times. The Chorus also simultaneously expresses the point of view of the English nation toward Henry — full of love and adoration for this "star of England" — and of the theatre-makers toward their audience. The Chorus repeatedly apologizes for the inability of a theatrical performance to do justice to the events being portrayed, and begs the audience's forgiveness for these shortcomings. Such sentiments were common in prologues and epilogues in plays of Shakespeare's time, but Shakespeare goes further: the Chorus also urges the audience to become an active partner in the creation of the theatrical experience, to engage their "imaginary forces" and "piece out our imperfections with your thoughts." The Chorus role is a brilliant piece of metatheatrical writing that reflects Shakespeare's understanding that any theatrical event is always a communal creation of the actors and the audience. 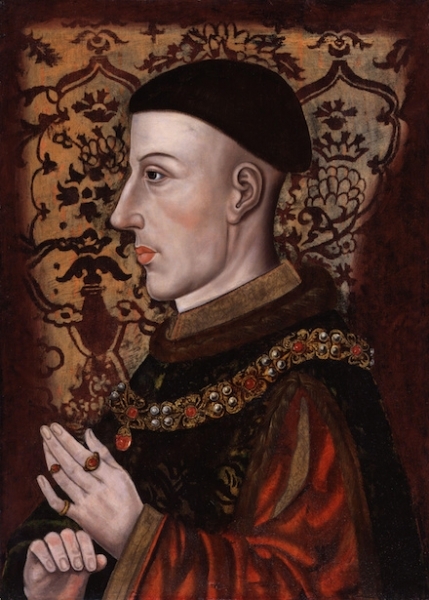 The common view of Henry V is that it is a patriotic celebration of a heroic king who led his ragtag army to victory over a much stronger enemy. And in the Chorus speeches and the way Henry is viewed by his followers, it is exactly that. 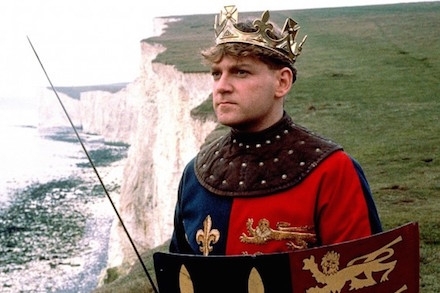 Henry is clearly an effective leader, and many readers and viewers find Henry's big speeches — such as the "band of brothers" speech that he uses to raise his army's spirits just before the battle of Agincourt — the most memorable parts of the play. We also get to see Henry as a mischievous prankster — a little bit of old Prince Hal rising to the surface? — and a charming, self-deprecating suitor of the French King's daughter. The play as a whole, however, presents a more ambivalent picture of Henry. For all his positive attributes, he is also a military commander with suspect motives, leading a war of aggression against another country. And while at some times he urges mercy to the French, at other times he is willing to go to brutal extremes to accomplish his objectives. In the great nighttime scene before the battle, we also see Henry in private and get a glimpse inside his head. There we see a man who is beset by doubts, fears, and self-pity that he never allows to show through in his public role as king. Even Henry's earnest wooing of Katherine becomes more complicated when we realize that she is a bargaining chip in the peace negotiations between their countries — and that Henry rejected a marriage with her earlier in the play, because the dowry offered was not sufficient. In addition, the play shows us the toll that the war and Henry's elevation to the throne has on his former tavern companions. Falstaff does not appear in the play, but his presence and the consequences of Henry's rejection of him hangs over it. And the other members of the tavern crew suffer greatly for their involvement in Henry's war. The storylines that began in the Henry IV plays are brought to a close in Henry V, and at the same time Shakespeare uses these characters to movingly demonstrate the human cost of Henry's war and his ambition to rule France. All of this makes Henry a more complicated character than he sometimes seems. Like the other kings we have seen in the history series so far — Richard II and Henry IV — Henry V is a complex, contradictory human being, and it is typical of Shakespeare that we are encouraged to view him from a wide variety of perspectives in the play. This is one of the reasons so many great actors have been attracted to the role. Shakespeare presumably wrote the part for the leading actor of his company, Richard Burbage — the same actor who would have created the roles of Hamlet and most of Shakespeare's other great tragic heroes. In modern times, Sir Laurence Olivier and Kenneth Branagh have both made popular film versions in which they played Henry. The combination of heroic leader, romantic lead, trickster, and troubled human being makes for a fascinating and challenging role. Ushers are still needed for a few performances. Sign up here and see the show for free!